The Thermo Fisher Isotemp 281A Vacuum Oven offers you steady vacuum added heating for quick and gentle drying. This lab oven is sturdily constructed with an epoxy coated exterior and a stainless-steel interior both resistant to corrosion and easy to clean. 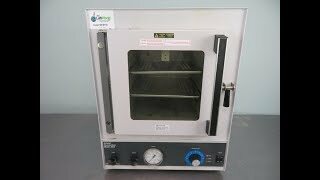 This 0.6 cu ft laboratory drying oven has a temperature range of between ambient to 280°C, with a 1000-watt heating element that wraps around the entire top sides, and bottom of the oven chamber. Temperatures for this Isotemp vacuum oven can be set from the upfront knob control, next to the vacuum control, with a vacuum range from atmosphere to 30 Hg with less than ½ hg in loss a day. This vacuum oven also features safety measures such as automatic back up control that kicks in should the temperature rise more than 5°C over the set point, and warning lights in event of a failure. Users can monitor temperatures of this vacuum oven through the dial thermometer, and pressure from the up top vacuum gauge. To monitor samples as a session goes on, the large tempered glass panel set in the door of this lab oven provides a clear view without disturbing the environment. The Thermo Fisher Isotemp 281A Vacuum Oven has been fully inspected and heated to its maximum temperature without issue. All of our lab equipment comes backed with our standard warranty. Should you have any questions, please don't hesitate to contact us.